A huge selection of patriotic party decorations, invitations, paper goods, accessories, tableware and wearables for your patriotic theme party. Decorate your table for a patriotic event with our waving American Flag stars and stripes paper goods. Perfect for the Memorial Day, the 4th of July or a salute to the troops. 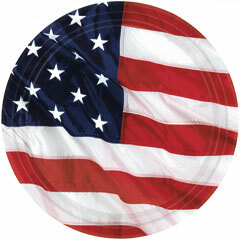 Our American Flag 10 1/2" plates are sold with 8 plates per pack. Please order in increments of 1 pack. Decorate your table for a patriotic event with our waving American Flag stars and stripes paper goods. Perfect for the Memorial Day, the 4th of July or a salute to the troops. Our American Flag paper 7" plates are sold 8 plates per pack. Please order in increments of 1 pack. Decorate your table for a patriotic event with our waving American Flag stars and stripes paper goods. Perfect for the Memorial Day, the 4th of July or a salute to the troops. 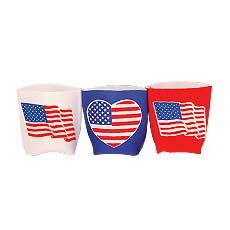 Our American Flag paper 9 ounce cups are sold 8 to the pack. Please order in increments of 1 pack. Decorate your table for a patriotic event with our American Flag stars and stripes paper goods. Perfect for the Memorial Day, the 4th of July or a salute to the troops. Our American Flag beverage napkins are sold 16 to the pack. Please order in increments of 1 pack. Decorate your table for a patriotic event with our American Flag stars and stripes paper goods. Perfect for the Memorial Day, the 4th of July or a salute to the troops. 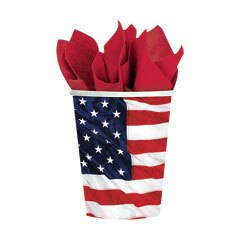 Our American Flag luncheon napkins are sold 16 to the pack. Please order in increments of 1 pack. AMERICAN FLAG Paper Table Cover (54'' x 102'') Decorate your table for a patriotic event with our waving American Flag stars and stripes paper goods. Perfect for the Memorial Day, the 4th of July or a salute to the troops. 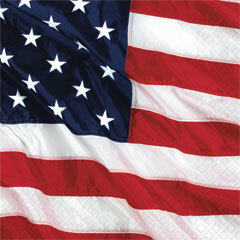 Our American Flag paper table cover (54'' x 102'') is sold by the piece. Please order in increments of 1 piece. 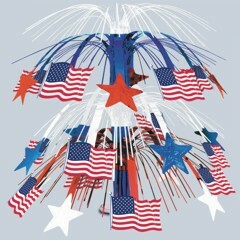 Show your patriotic spirit and decorate your table with our 18" metallic stars and American Flag cascade centerpiece. Perfect to decorate your table for 4th of July, Memorial Day, Election Day and Welcome Home events. Our American flag cascade centerpiece is sold by the piece. Please order in increments of 1 piece. 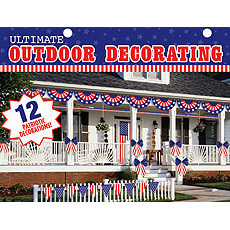 This great kit makes decorating easy for your Patriotic Party! 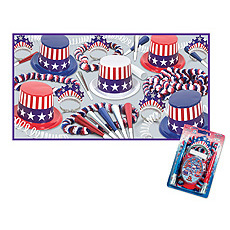 For a bigger Patriotic Party, pick up this Patriotic Party favor kit! Great Stars and Strips Patriotic Party supplies! Patriotic Party decoration great for kids! Our wind spinners can be used as a part of your centerpieces and decorations, as a party favor or gift for bridal showers, birthday parties or fund raising events. 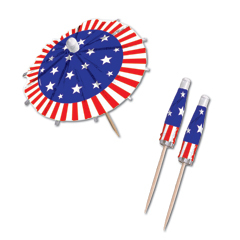 This beautiful 14" Patriotic Triple Wind Spinner comes in its own bag with simple instructions. 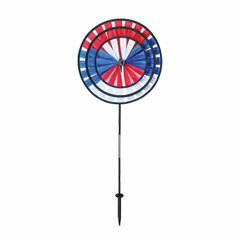 Our red, white and blue triple flower Wind Spinner is sold by the piece. Please order in increments of 1 piece. Perfect for your Patriotic Party! 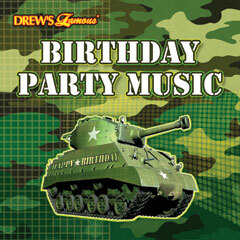 Our patriotic birthday party music comes on a camouflage music CD. 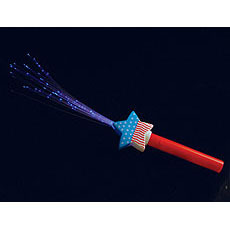 Use for birthdays or any patriotic event. Our Camouflage Music CD includes: "This Land is Your Land", "God Bless The USA", "Boogie Woogie Bugle Boy", "When Johnny Comes Marching Home", "America the Beautiful", "Star Spangled Banner", "Happy Birthday To You" and many more. Our patriotic music CD is sold by the piece. Please order in increments of 1 piece. Please Note: CD's and DVD's are not returnable for either credit or refund. 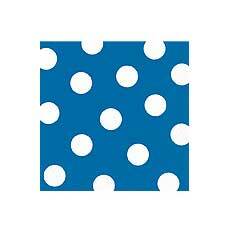 Any returns for defects will be replaced with the exact same item. Patriotic Party decorations for the traditional look! 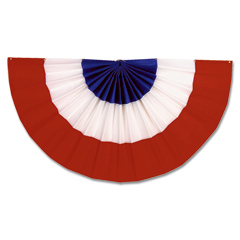 Decorate in style with our velvetized plastic indoor or outdoor bunting. Each red, white and blue bunting is 24" deep and 48" wide. 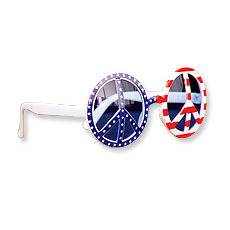 Perfect for decorating for your patriotic event. 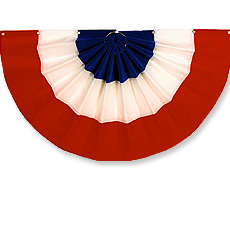 From the 4th of July, to Election Day to a great big welcome home show your patriotic pride with traditional bunting. Our 48" bunting is sold by the piece. Please order in increments of 1 piece. 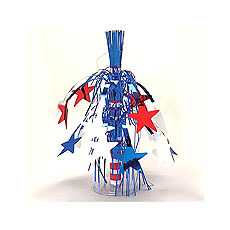 Don't forget this festive centerpiece, perfect for a Patriotic Party decoration! Fun Patriotic Party Supply to decorate with! 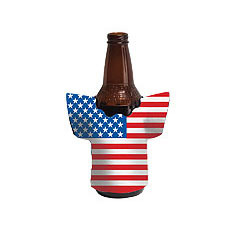 Awesome Patriotic Party drink holder! 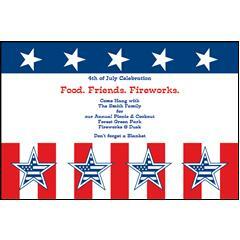 Our Patriotic Events custom invitation is the perfect choice to invite guests to a special patriotic celebration! Patriotic Events invitations are available in 2 sizes, 4" x 6" or 5" x 7" with matching size envelopes and can be used as an invitation, save the date or special announcement. Choose from 12 type styles and 24 colors when you customize this invitation for a special party. All custom invitations are printed on hiqh quality card stock and are sold in a minimum of 10 invitations. Additional invitations can be ordered in 2 invitation increments. 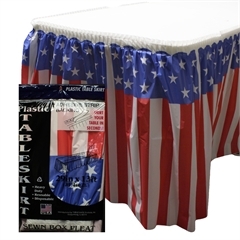 Decorate for your next patriotic party in full detail with our 29" by 13' red, white and blue Patriotic Plastic Table Skirt. This simple yet stylish table skirt is perfect for hiding unseemly table legs at parties and conventions. 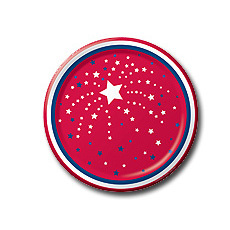 Our stars and stropes accented Patriotic Plastic Table Skirt is perfect for mixing or matching with your specific color scheme or party theme. 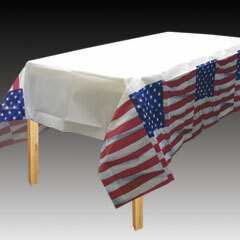 Our Patriotic Plastic Table Skirts are NOT flame resistant and come with an adhesive back for easy use. Please order in increments of 1 table skirt. Great Patriotic Party Favor kit for 10! Fun and festive Patriotic Party favor! 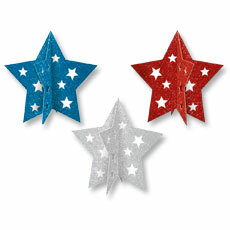 Add this red, white and blue star stringer to your patriotic decorations. 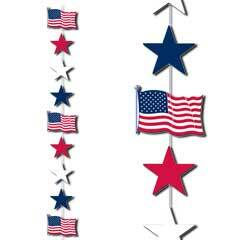 Our red, white and blue star stringer is 6 1/2' long and can hang from anywhere and is sold by the piece. Please order in increments of 1 piece. 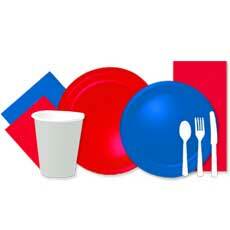 Patriotic Party supplies, great for a sit down dinner! 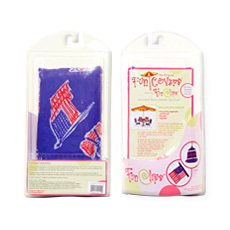 Our 1 1/2'' Patriotic Temporary tattoos come in a great assortment. Perfect for the 4th of July or any time. Packed in a polybag of 1 gross (144 pieces). Please order in increments of 1 gross. Uncle Sam would have been proud to see this tissue replica of his top hat. 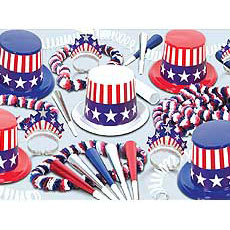 Our 12" patriotic top hat is perfect for table decorations for all your Americana events. 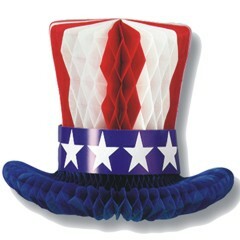 Our 12" Uncle Sam tissue top hat is sold by the piece. Please order in increments of 1 piece. Looking for a great accent to your appetizers on the 4th of July? Our patriotic 6" umbrella picks are packed 24 to a bag. Please order in increments of 1 pack. Check out this Patriotic Party decoration! Give PEACE a chance! 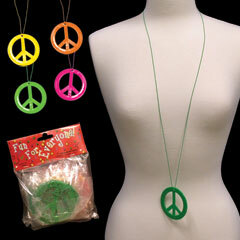 Dress up for a 60's party with our colorful assortment of 2" neon peace sign necklaces each on a matching cord. Peace is in through the generations. Our peace sign necklaces are packed in a poly bag of 1 dozen pieces in assorted neon colors. Please order in increments of 1 dozen. 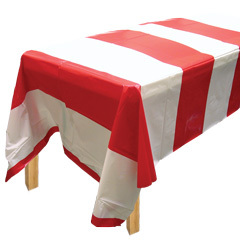 Our red and white stripe plastic table cover is 54" wide by 108" long and is a great accent for your holiday table. The red and white stripe table cover is sold by the piece. Please order in increments of 1 piece. 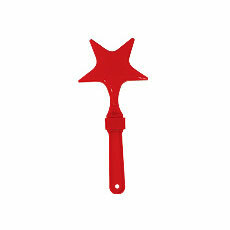 Here a red star, there a red star, put a red star anywhere! 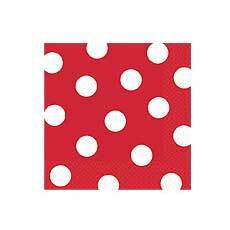 Add to your decorations our 15" 2 sided foil red stars. 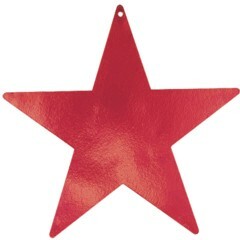 Use your imagination and hang our red stars from the ceiling, over or on tables or in windows for a star studded evening. 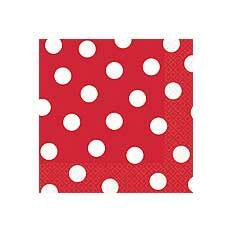 Mix and match with all of our red foil decorations for school events, holidays and special events. Our red 15" stars are sold 5 to the pack. Please order in increments of 1 pack. 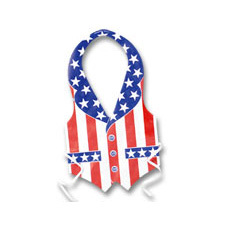 Fun patriotic party favor for your 4th of July party!